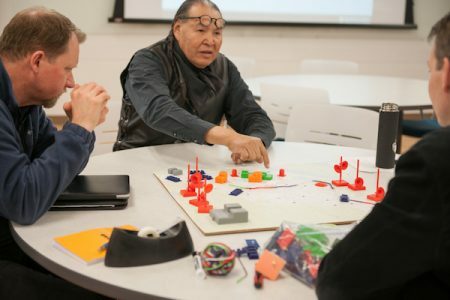 True to its location in Festival City – also known as Edmonton, Alberta – the 2018 Indigenous Connectivity Summit’s training day crackled with the energy of community networking advocates from around the world. Held at the Faculty of Extension at the University of Alberta, the event began with a smudging ceremony led by Dr. Lana Whiskeyjack from Saddle Lake Cree Nation. Lana spoke about the role of smudging to ground ourselves through ceremony. Herman Many Guns from Piikani First Nation then said a prayer and thanked our Treaty 6 hosts for allowing us to host the event on their territories. Returning to the main venue, Jane Coffin from the Internet Society stressed that community networks are not “pirate” initiatives but rather efforts by communities to support community development through locally-owned and operated broadband. They aim at long-term sustainability and are driven by cooperation and innovation: “They inspire us to think differently and to solve problems together.” Jane also pointed to the barriers these initiatives face, including inappropriate licensing and permits, high taxes and fees on equipment, limited access to financing and funding, and restricted spectrum. Governments and regulatory agencies play an important part in addressing these issues. Next, I provided an overview of community networking initiatives in Canada. These projects stretch from coast to coast to coast, and are reflected in the work of the First Mile Connectivity Consortium (FMCC), a national association of Indigenous technology organizations. FMCC member organizations work to ensure that broadband development puts community desires and interests first – and illustrate the many ways we can build network infrastructure and services from there. To this end the FMCC has engaged in policy and regulatory interventions to establish and fund their work. A “whole community” approach that conceptualizes connectivity beyond individual households to encompass key institutions and public services – and recognizes all our relations – can help ensure these projects remain vibrant and sustainable. Network design focused on how community networks are planned and sustained, and included discussions of digital literacy and capacity building. We heard about Matt Rantanen’s work with Tribes in Southern California to build and operate a regional network, as well as his efforts advocating for Native American connectivity in North America and internationally. Travis Schindel discussed the Mackenzie Valley Fibre Link serving the NWT, while Brian Beaton spoke about K-Net’s development journey in NW Ontario. Digital literacy initiatives included Gordon Gow’s technology stewardship training in Sri Lanka and Trinidad, Denise Williams’ work with the First Nations Technology Council to develop Indigenous digital skills training in B.C., the Gwich’in Digital Literacy project involving Crystal Fraser and Trish Fontaine, and Deb Socia’s work with Next Century Cities in the U.S. Michael McNally gave a hands-on demo of the “Make the Net-Work” community network planning exercise, which involves open source 3D printed pieces, network yarn, and a map mounted on pegboard. This stream ended with Allan Mackenzie’s inspiring demonstration of language app development undertaken by Mi’kmaw Kina’matnewey in Atlantic Canada. Funding and policy/regulation explored avenues that community networking champions can pursue with regulators, governments, and other partners. Sally Braun from Western James Bay Telecom Network discussed her team’s experience applying to Innovation, Science and Economic Development Canada’s “Connect to Innovate” fund – and provided a checklist for others interested in preparing proposals. James Alexie offered an overview of funding agencies in the U.S. On the policy/regulatory side, Maria Alvarez presented spectrum set-asides that the Mexican government established for Indigenous community networks, while Teresa Hopkins discussed the Navajo Nation’s Telecommunications Regulatory Commission. Heather Hudson gave an overview of policy and regulatory frameworks for rural and Northern broadband in Canada and the U.S., while I presented about the CRTC’s recently established broadband fund. Technology included considerations of both fixed and wireless networking equipment. Nico Pace from AlterMundi spoke about his team’s work building and deploying “geek free,” open-source wireless routers in Argentina and other countries. We heard about Bruce Buffalo’s efforts to provide free wireless connections to his home community of Maskwacis through Mamawapowin technology society, and the regional fibre network being developed by Bill Murdoch and others at Clear Sky Connections to service Manitoba First Nations. We also heard about speed and quality of service monitoring activities in Indigenous communities, including the ConnectIN project developed by Bill Murdoch, Denise Williams and Don Ginther from the Alberta First Nations Technical Services Advisory Group, and May Lynn Lee from Cybera. What barriers do their projects face? How can governments and regulatory agencies support their work? And how can we ensure that policies, regulations and funding programs address the specific needs of community networks, as well as of larger-scale commercial projects? These and other questions are being explored in the Arctic during this week’s Summit. Stay tuned!